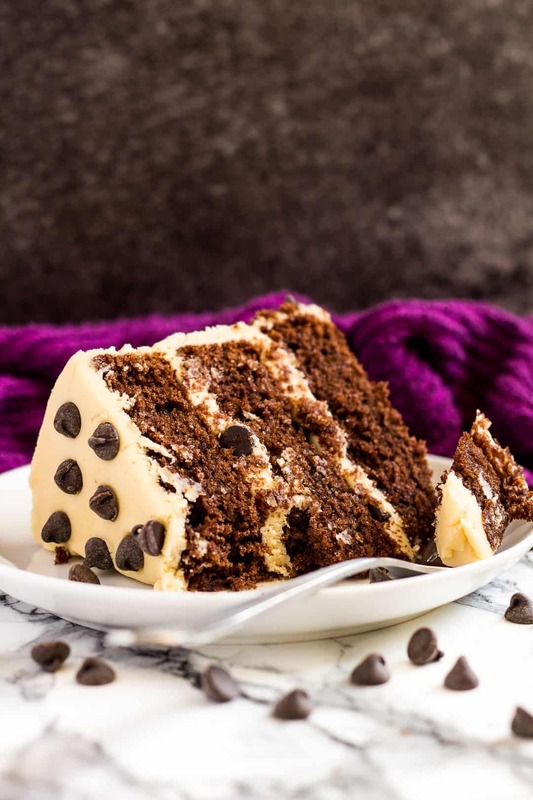 Mocha Layer Cake – Incredibly moist and fluffy chocolate layer cake infused with coffee, and frosted with a sweet coffee flavoured buttercream! The last layer cake recipe I brought you was my Lemon Raspberry Layer Cake (which I highly recommend you try!) back in April, so it’s about time I bring you a new one. 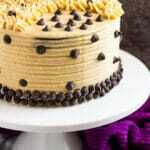 How about a big slice out of this Mocha Layer Cake? 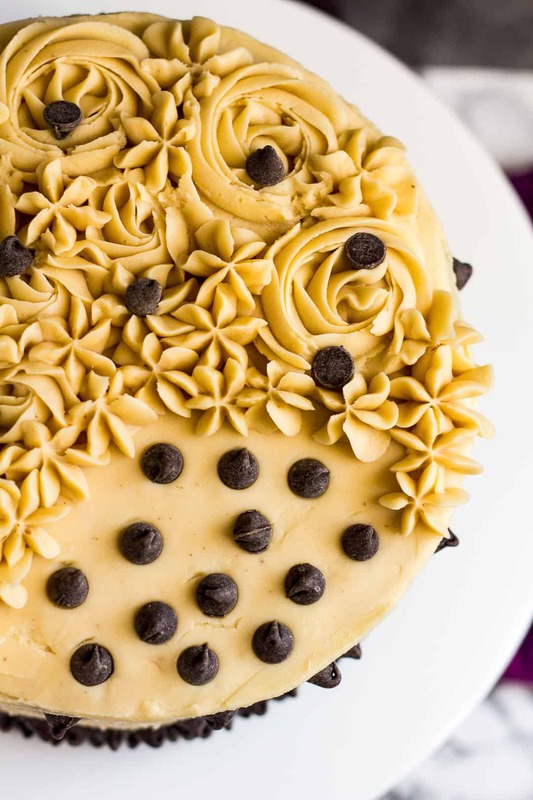 If you love chocolate and coffee, then this cake is for you. Not only are the chocolate cake layers lightly infused with coffee, the buttercream frosting is also loaded with coffee flavour! I’ve been wanting to make a mocha cake for a while now, and I’m happy to say it’s finally here! 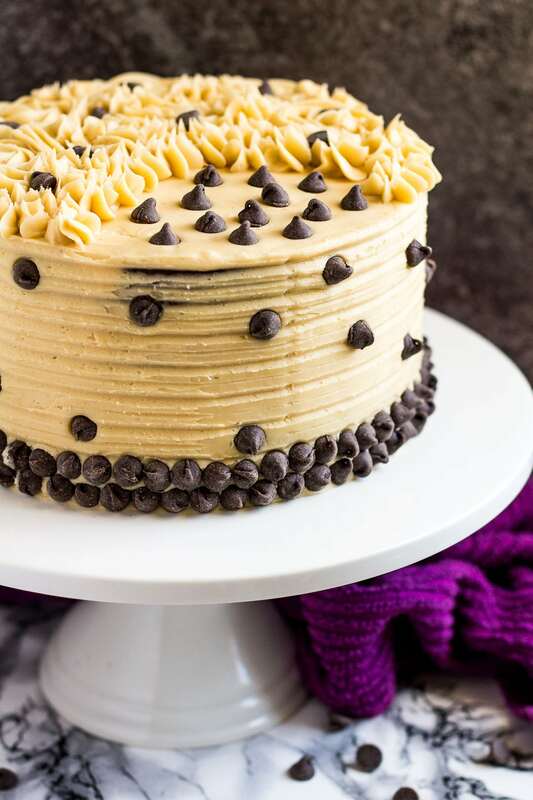 This mocha layer cake is lightly infused with coffee in two delicious ways. 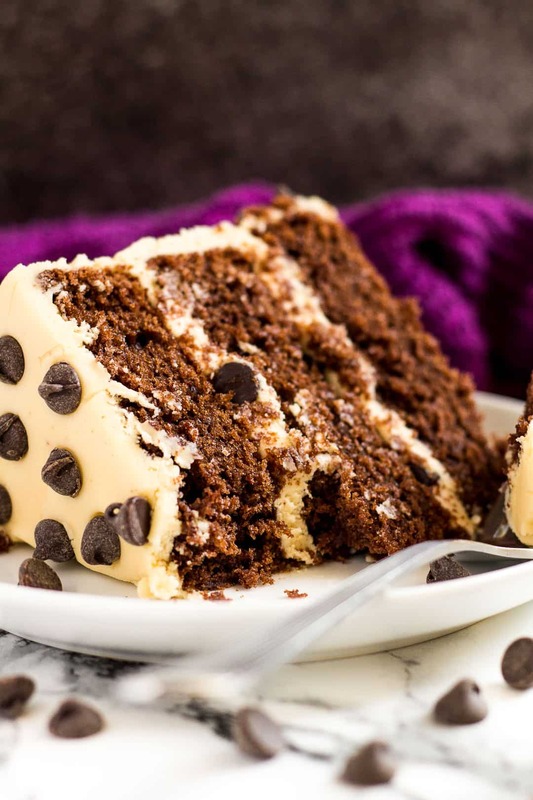 Four teaspoons of coffee dissolved in hot water is added to the cake batter, and two teaspoons is added to the buttercream frosting. I found this to be the perfect amount of coffee flavour for the coffee lovers (and non coffee lovers!) in my life. If you’d like a stronger coffee flavour, see my recipe notes. This recipe makes a 3 layer 8-inch cake, which will easily yield 12 – 14 slices. A perfect, indulgent dessert for party season! How long will this mocha cake last? This cake and any leftovers can be covered tightly and kept in the fridge for up to 3 days. Can I freeze this mocha layer cake? Yes. This cake, frosted, freezes well for up to 2 months. You can also make this cake a day in advance! After the cake layers have cooled completely, wrap in clingfilm and store at room temperature overnight, ready to be frosted the next day. The frosting can also be covered and kept in the fridge overnight. Try these delicious mocha recipes next! Preheat the oven to 180C/350F/Gas 4. Grease three 8-inch cake pans and line the bases with parchment paper. Set aside. Whisk together the eggs. Add the sugar, and whisk until combined. Add the vanilla extract, vegetable oil, yogurt, and coffee, and whisk until combined. Gradually fold in the dry ingredients. Divide the batter between the prepared cake pans, and bake for about 30 - 35 minutes or until a toothpick inserted into the centre comes out clean. Allow to cool completely in the pans on a wire rack. Using a handheld or stand mixer, beat the butter until pale and creamy. Add half of the icing sugar, and beat until combined. Add the remaining icing sugar, and beat until smooth and combined. Add the coffee, and milk, and beat until light and fluffy. Add more milk if needed. Top with the final layer, and cover the entire cake with a thin layer of frosting to lock in the crumbs. Refrigerate for about 30 minutes until the frosting is firm, then spread with the remaining frosting, leaving some for piping swirls on top, if desired. *Make your own cake flour! Measure out 3 and 3/4 cups (468g) of plain/all-purpose flour, remove 7 tablespoons, and replace with 7 tablespoons of cornflour/cornstarch. Sift well. For a more stronger coffee flavour in the cake layers, add 6 teaspoons of coffee dissolved in 3 tablespoons of hot water. Lemon and raspberry are such a good combo!! 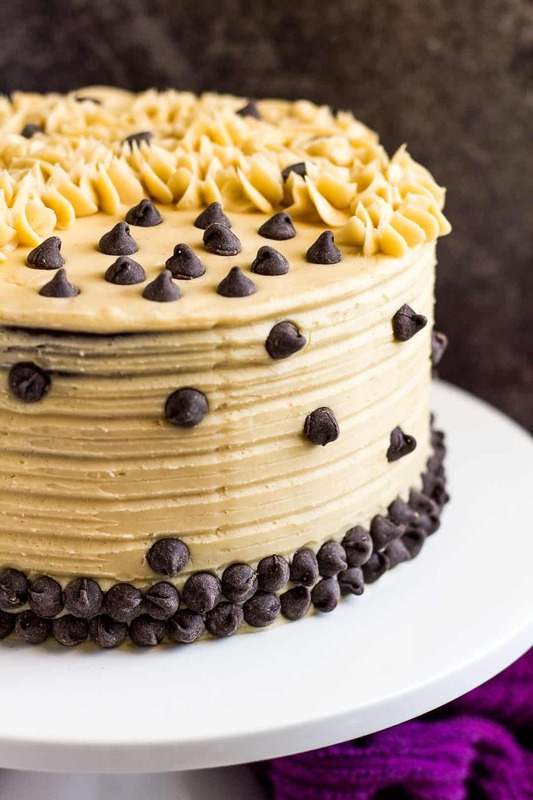 But now you’ve got my drooling over this mocha layer cake. There’s just something about the holiday season that has me craving mocha everything. What a gorgeous treat, my friend! The icing for the mocha layer cake is it really 12 cups of powdered sugar? That’s a lot. Not that I don’t like icing with a lot of sugar. Just checking maybe a typeo? Am making this cake today. for the frosting…3 c or 3 sticks of butter?? ?